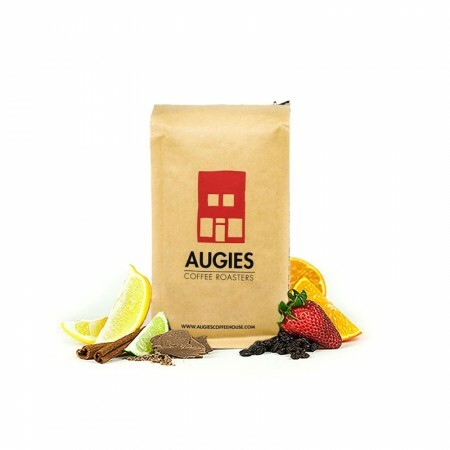 This is the Guatemala Francisco Morales brought to you by Augies Coffee House. This fully washed coffee was sourced from the growing region of Huehuetenango in Guatemala and was produced by Francisco Morales between 1,600 - 1,850 meters. The cup has rich and complex notes of pink lemonade, toffee, cherry pie, and walnut. I am enjoying this coffee a lot. It's a liitle tricky to dial in. I needed to lower my usual ratio from 16:1 to 15:1 to get better extraction/flavor. Aroma is definitely cocoa-like. Bright and fruity but rich too. Not sure of the best grind setting, but performs well with a medium to med/fine grind. Very complex! The fruit flavors are very light. Some nuttiness and spices round it out. Bright and clean. The sweet, fruity notes are definitely dominant. This has been my favorite coffee thus far. Easy to brew in the chemex and not as burnt tasting on the aeropress. I can taste more elements in this coffee. This one was difficult to prepare. I like adding some milk and sugar to my coffee, but this one didn't work well. Too little and the sourness was overwhelming. Too much and the sweetness competed with the tart flavors. Very solid Guatemala. The tasting note of Cola had to grow on me, but I have enjoyed this coffee. Enjoyable. The coffee notes of (flat) cola and cherries were there for me. Maybe not my favorite coffee ever -- I think I'd want something balanced with more brightness than I found -- but I've had no problems going back to it. This coffee goes fast. I love, love the cherry pie notes.